Before I share the contents from the first week of The Body Shop 24 Days of Beauty Advent Calendar, I just wanted to give a quick thanks to those of you who entered my giveaway to win one of these. The winner has been contacted and hopefully the calendar will be in her hands soon! I do hope that my new followers stick around, though. I'd like to think I have some fun content for you, if you were interested in this beauty calendar! Whenever I have a beauty advent calendar, I do weekly posts every Friday. I usually share daily snippets on my social media, but I completely forgot this year. I might pick that back up or just keep it quiet until these round-up posts. Here's my quick thoughts on what the first 8 days brought! Mango Lip Butter - I love the lip butters and I actually didn't have a mango one. I have a lot of lip butters though, so I might stick this in the stocking of a specific person I know that also loves mango scents. 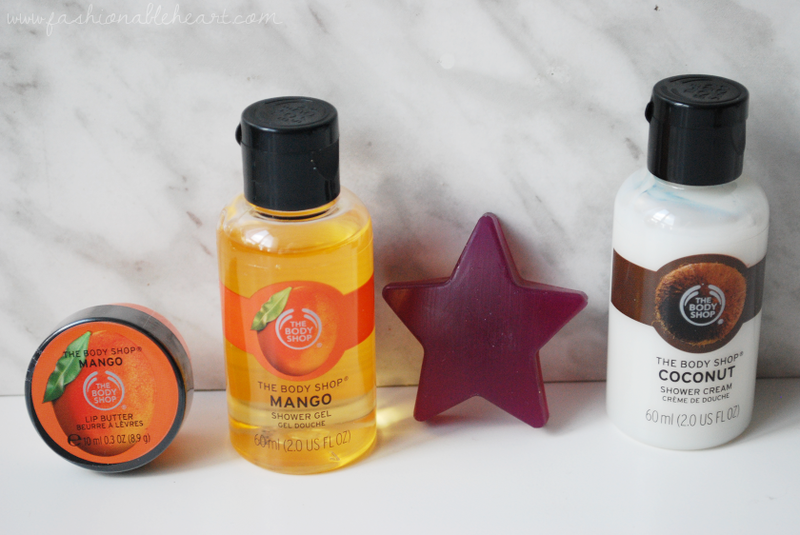 Mango Shower Gel - Definitely keeping this one for myself! I love how fresh this smells and it makes my whole bathroom smell delicious. Frosted Plum Soap - If I want to use this one, I'll have to hide it. My husband always steals these! I will say they are a small size for what you would pay in store. They smell good and lather nicely, but you don't get a lot of bang for your buck. Coconut Shower Cream - I have the full sized version in my shower right now, because it works so well with my dry skin. I have the Coconut Body Milk lotion too. A perfect duo! Coconut oil is magical. Nail File - I almost typed "nail fail" and that's kind of what this is for me. I just rarely use these and it's just not my favorite when they are included. Pink Grapefruit Shower Gel - I don't do well with citrus scents, so I'll be passing this along to my husband. He is a morning shower person, so I think this will be great at waking him up. Strawberry Shower Gel - You know how certain scents take you back in time? This is one for me. This is the first scent that ever attracted me to The Body Shop and it remains a favorite. Their strawberry isn't overly sweet! 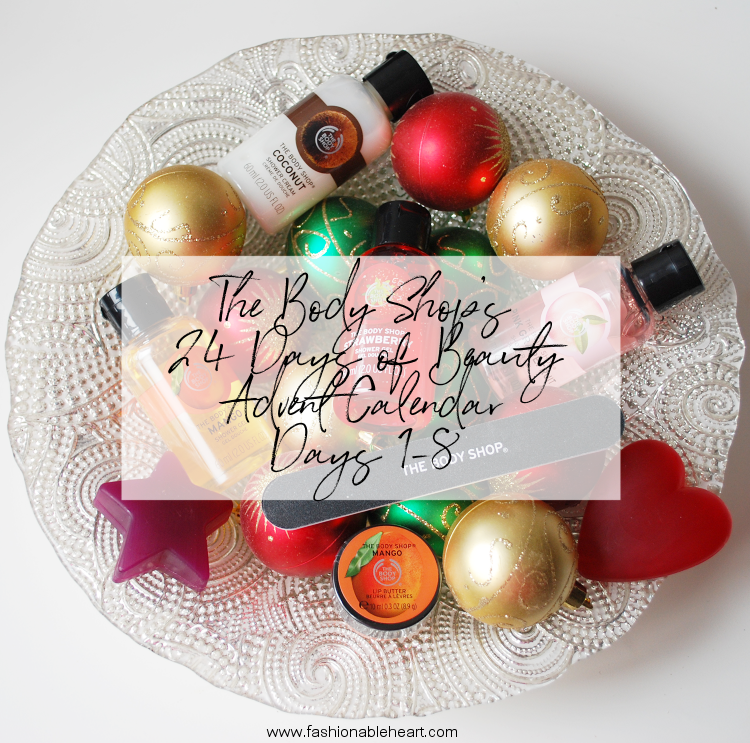 **The Body Shop 24 Days of Beauty Advent Calendar was provided to me for testing purposes. All thoughts and pictures are my own. There are no affiliate links in this post.